If I want to use a V6 with an old analog camera like my 6x7 (no hot shoe): Which cable I have to buy or is it part of the Standard Package on the V6 - or can I use the old cable from my V2s Senders? The V6 comes without any cables, but your old V2s cable should work. I never owned a V2s, but I'm assuming that on the trigger end the cable has a 3.5mm connector. If so, I'm pretty sure it will work with the V6. You can also check my overview of cables for the V6, to see which types are available. Meanwhile I got a pair of V5 & V6. 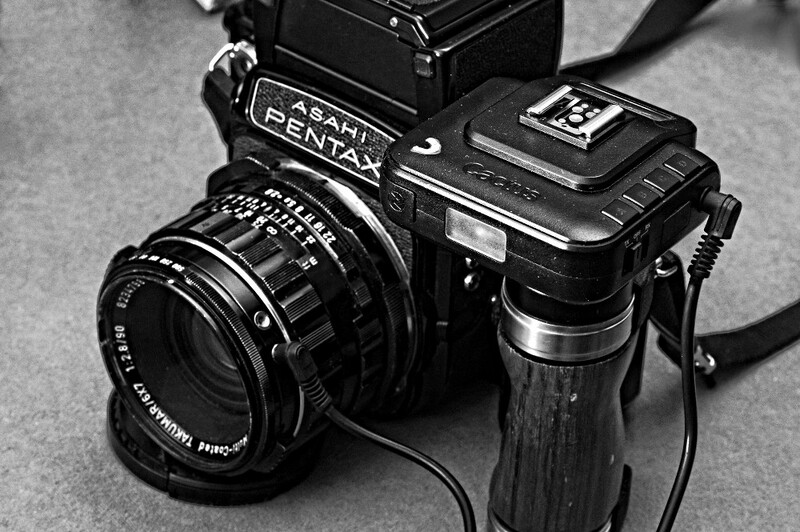 The V5-Duo-Set comes with some cables, but if I fix the sender (either V5 or V6) to the woodn handel of the Pentax 67 the cable is not long enough to reach the plug connector at the front of my 90mmLS-Lens. The old V2s cable has been longer and with this cabel everything works fine. The cold shoe of the P67 has a very sharp edge whithch prevents that the V6 can be pushed to the end of the shoe. Nevertheless it can be clamped sufficiently.